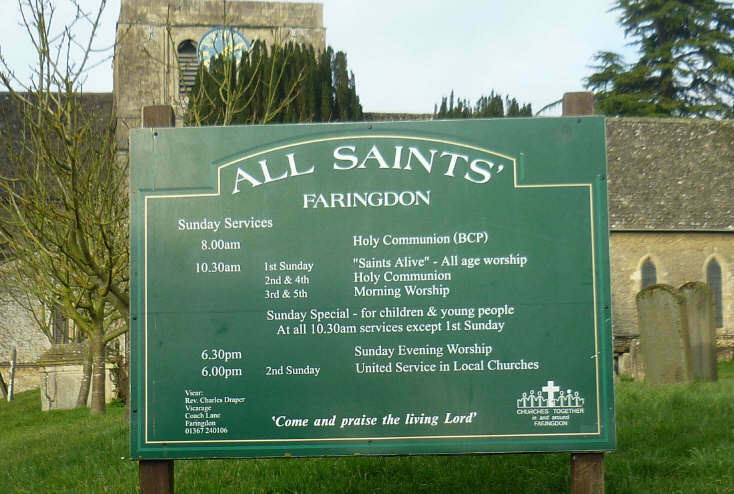 All Saints Church - Faringdon Community Website. ​Bank Holiday Mondays from 2 pm to 5 pm. At other times, the key may be obtained the Tourist Information Centre (01367 242191) in the Market Place. Like all English medieval churches, All Saints was built for Roman Catholic worship. After the Reformation most churches were altered to new requirements, and have been further changed by desecration, extension, rebuilding and internal alteration, demolition or conversion to other uses. All Saints is no exception. It stands up from the Market Place, from where the large face of its tower-clock can be read by shoppers and those waiting for a bus. The central tower rises stumpily above the roofs of the nave and long chancel. A stone pavement leads up to the splendid c13 south door (huge iron hinges of "agitated scrollwork", several branches ending with dragons' heads) which opens into the south aisle. The round-arched nave of five bays is Norman, the capitals its six columns decorated with axe rather than chisel; the clerestory windows, corbel frieze and flat buttresses outside the west end all point to the c 12. The splendid organ of some 1390 pipes (1969) is awkwardly placed by the west window and the small choir sings from behind the congregation. The south aisle is part of the Victorian re-building, its small west window by Wailes. About the same time the North wall, pierced by two six-light Perpendicular windows, had a baptistery chapel added, with a re-set Norman door and octagonal font decorated with Perpendicular traceries. The north transept seems, because of the three large north windows, to be doubled, but actually the western part, the Unton Chapel, was added in the c14 with its own window without a party wall. It contains monuments of the Unton family; the early Renaissance tomb chest, with painted shields, of Sir Thomas [+1533]; against the wall, brasses of Sir Alexander [+1547] and two wives; for Sir Edward [+1583] a large alabaster tablet with twin arches and allegorical figures. Of the substantial monument to Sir Henry [+1596], the bombardments of 1645-1646 have left only the large inscribed wall tablet and the life-size kneeling effigy of (?) his widow. The south transept, rebuilt in 1853 [Hugall], with Kempe windows of 1888 in the east wall, has been further modified by the skilful insertion in 1998 of the "Asset" [All Saints S.E. Transept] Room on a new first floor, and other facilities. On the south wall of the transept is encased an iron cannon ball from the Civil War bombardments. Up inside the "richly shafted" tower crossing [c 12] are eight heads; odd details are due to repairs after its steeple was felled in 1645. The early c 13 chancel, with c 19 glass in all its lancet windows, contains pre-Reformation survivals: the piscina with trefoil arches; and the later sedilia. Among the tomb slabs in the floor is that to Sir Marmaduke Rawdon, garrison commander in 1645. A broad arch leads into the north chapel. The earliest monument, in the style of Grinling Gibbons, is for Henry Purefoy [+1686] with two weeping putti, cherubs' heads and vase at the top. Three monuments commemorate members of the Pye family, who then owned Faringdon House. The white marble and black columns of the one to Jane [+1706] has putti about "an open curly pediment" topped by an urn. A plainer one, of grey marble, is for Anna [+1729]. Henry [+ 1749], husband of the two preceding, is commemorated by an obelisk faced with an oval portrait of his young son. The building stands in a church yard, filled with tombstones and tombchests, the last dated 1982, after the cemetery in Coach Lane was opened. Many inscriptions have been eroded by the weather of centuries, some to the point of illegibility. On the exterior of the east wall of the Chancel is a monument inset with the cannon ball said to have struck down the naval officer commemorated. A list of these tombs can be consulted in the Faringdon library. Pevsner, Berkshire, p 139. Surveyed by NADFAS in 19..